Guacamole is an avocado-based dip that originated in Mexico. It is traditionally made by mashing ripe avocados with a molcajete (mortar and pestle) with sea salt. Some recipes call for tomato, onion, lime juice, chili and or additional seasonings. Guacamole was made by the Aztecs as early as the 16th century. Early recipes from the California Avocado Advisory Board (Calavo), published in the 1940s, were accompanied with a pronunciation suggestion: "Say Huakamole". Later marketing tried to create a "luau" or Pacific Island image of the avocado in the 1960s, and a Spanish or Mediterranean image in the 1970s. Guacamole has pushed avocado sales to 30 million pounds on two days a year: Super Bowl Sunday and Cinco de Mayo. In skillet, heat oil over medium heat. Add pork sausage, breaking meat up as it cooks, add 6 ounces beer, stir well, cook until no longer pink and liquid has reduced. Add jalapeno refried beans, stir well. Stir in chipotle enchilada sauce. Add onions. Stir and reduce heat to low. Cook about 4 to 5 minutes. 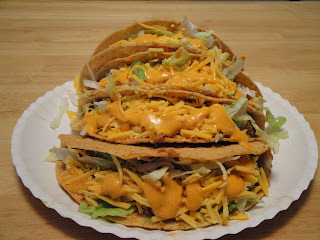 Add spoonful of meat into taco shells, then add guacamole, shredded lettuce, cheddar cheese, drizzle chipotle creamy sauce. Enjoy! Note: Chipotle creamy sauce is a new product. I just had to try it. I'm glad I did. Tacos, great food. When I am out shopping if I don't get anything else gluten free. Tacos are my open option. I love mexican food, sausage supreme sound wonderful and I didnt know about the guacamole either! These tacos look simply delicious, I have avocados that I can turn into guacamole:) Happy New year to you Christine. I love tacos and these look fantastic. Thanks for the food history on guacamole. This is certainly something that has a lot of southwestern flavor notes, definitely perfect for when the craving hits. Great idea using the sausage and I will be on the lookout for the chipotle creamy sauce. Awesome post-yum! I could eat guacamole all day long every day. I never tried sausage in tacos. Mexican dinners are a favorite in my house. Everything is better on a corn tortilla! WOAH! There's ALOT going on in here! A lot of tasty flavors that is!!! I love mexican food, and guacamole is one of my favorites. As always great info and history behind the meal! Look fantastic and sounds like a wonderful recipe!!! !Have a wonderful 2012!!! I LOVE guacamole, but had no idea it was from Spain! Tacos looks great! Ooohh I love the idea of pork sausage in tacos! I absolutely have to try this! The sauce was the first thing I noticed--it almost looks like an aioli. These look wonderful! Thank you, Lacy! I hope you enjoy. Another informative post, Christine! I love tacos, and yours look so delicious! Can't wait to read more food infos and history from your blog! More power! The addition of beer is interesting. Love the photo - looks so appetizing. 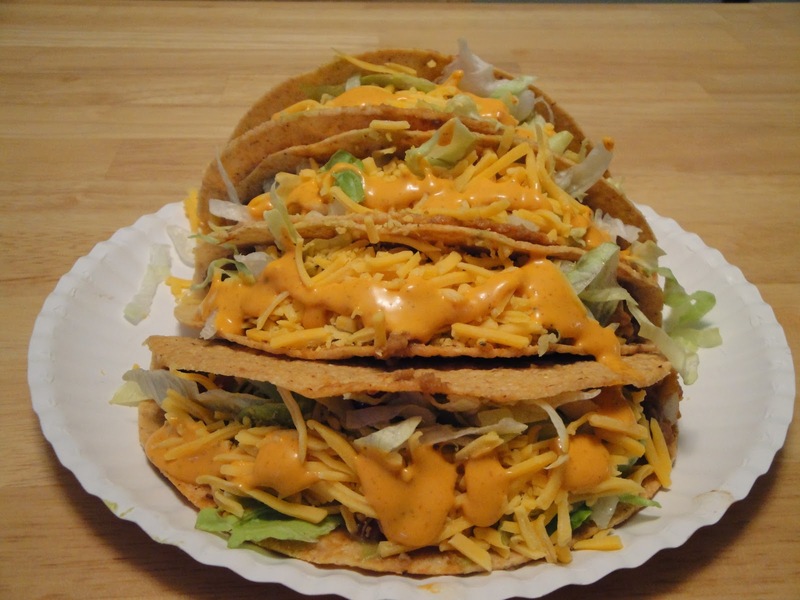 I adore tacos, I mean like really really adore tacos. These look really good. I'd eat 2 or 20. Mmm this post made me SO in the mood for tacos! Hello everyone! I made an error on this post, and have updated, it's now correct. I apologize for the error. Guacamole is an avocado-based dip that originated in Mexico, not Spain. Again, I apologize for the error. These tacos sound really delicious Christine! They look so bad for you, and yet so irresistible. Perfect football-watching food!